If you notice a small puddle of red fluid underneath your vehicle, this is not a good sign and indicates a transmission fluid leak. It will form stains on your driveway or garage floor but more importantly, it can cost you a lot of money in repairing the leak and replacing the fluid. To understand the reasons behind leaking transmission fluid and the cost to repair it, keep reading. Your transmission may leak because of minor issues or critical ones. Despite the type of problem that it is, you should never let a leaky transmission wait. Get it checked right away. If you wait to get a simple repair done, the problem will get much worse and cost you more money to fix. 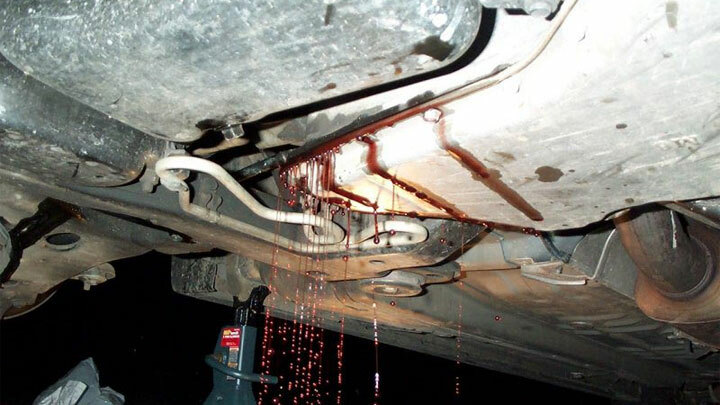 Here are 5 of the most common causes of transmission fluid leaks. Over time, your transmission pan will eventually experience some wear and tear. This is because while driving, the pan of your transmission is susceptible to damage from all the loose rocks and debris on the road. If the pan gets a small puncture or there are loose drain plugs or bolts, then a leak can occur. 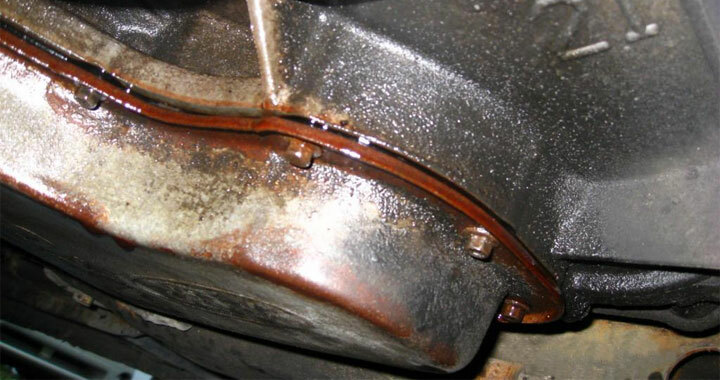 If a big rock or other object were to damage the pan, the transmission will lose fluid quickly. You will know right away when this is happening. On the other hand, a small hole or puncture will take longer for you to notice. If your drain plug or bolt is not tightened enough (or over-tightened to the point of stripping), it could cause a leak too. Too often, this happens immediately after you change the transmission fluid. An automatic transmission sustains hydraulic pressure through a variety of transmission seals. However, over time, these seals will crack and get worn out, especially when being exposed to heat often. If you get a transmission leak from this, there are many areas of the transmission to check. Most commonly, you’ll find the leaky seal in either the input shaft or output shaft. Otherwise, you should also inspect the transmission pan, driveshaft, plug seals, sensors, shifter housing seal, valve body, tail housing seal, and speedometer input seal. The gasket on your transmission pan can become damaged or cracked due to poor manufacturing, bad gasket alignment during the previous install, or constant exposure to hot temperatures. The pan gasket is cheap to replace so you should do it right away. Otherwise, more serious problems will soon follow. Transmission fluid is propelled into the whole system by the torque converter. If this torque pump has a crack anywhere on its body or has damaged needle bearings, it will leak transmission fluid. Since this isn’t a simple fix, taking your car to the mechanic for replacement is often the only option. The fluid lines of a transmission are constructed of either steel or aluminum. These lines are usually quite durable but if they get damaged from road debris or exposed to heat too often, then the lines can crack or even completely break. If you have fluid leaking from your transmission, the typical cost to repair the leak (without taking off the transmission) is between $150 and $200. For this amount, you will get a replacement of the pan bolts, drain plugs, seals, gasket, fluid lines. However, the true cost will be determined by where the leak is actually coming from on the transmission. If the front seal is where the leak is, then you will have to remove the transmission first. This will obviously increase the price of the repair job by a good amount. The auto mechanic will observe where the transmission fluid leak is coming from. They will be able to tell the location based on how the fluid is dripping. Most of the time, the transmission fluid will go down a path that has the least resistance to it. If the leak is caused by a part that is loose, this part will get tightened by the mechanic. If the part is damaged or cracked, then it will be replaced. Before any of this work is done though, the mechanic will give you an estimate on how much this will all cost to perform.